Ōyamato Jinja (Shrine) dates back to the Nara Period (710-794) and even before. In 1941, the year that battleship Yamato was commissioned, artist Inshō Dōmoto painted Ōyamato Jinja. This painting hung in the captain's cabin on battleship Yamato, since the spirit of Ōyamato Shrine also became the ship's guardian spirit. In the Nara Period, departing ship crewmen would visit Ōyamato Shrine to pray for safety on the voyage, which connected the shrine to battleship Yamato in addition to its name. The names Ōyamato and Yamato both use the same two kanji (Chinese characters) of 大和. In 1953, a small shrine (soreisha) on the grounds of Ōyamato Shrine was built in remembrance of the spirits of 2,736 men who died in battle when battleship Yamato sank on the way to Okinawa on April 7, 1945. It also has enshrined the spirits of 985 men aboard the light cruiser Yahagi and eight destroyers who died in battle when Yahagi and four destroyers sunk were escorting Yamato. These ten ships were part of the Surface Special Attack Force. The designation of special attack force (tokubetsu tokkōtai) was given to the 2nd Fleet of ten ships since there was no expectation of return for what was considered essentially a suicide mission against the American fleet in an attempt to reach Okinawa to assist soldiers fighting there with Yamato's heavy guns. 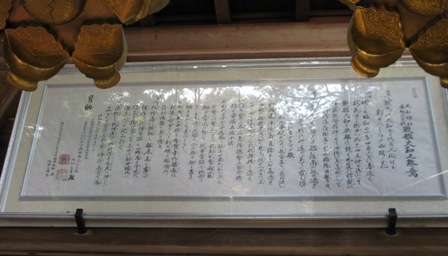 The main shrine building of Ōyamato Shrine has the lyrics for two biwa (Japanese lute) songs about battleship Yamato. They are entitled "Battleship Yamato's Brave Battles" and "Battleship Yamato's End." In 2011, an exhibition room about battleship Yamato opened. This room has on display a model of battleship Yamato and other related items. In 2005, 60 years after the war's end, the Battleship Yamato Spirit Festival was held at Ōyamato Shrine. After that, it has been held annually on August 7. There is also a 2nd Fleet War Dead Memorial Ceremony held each year on April 7. Ōyamato Shrine is about a ten-minute walk away from Nagara Station. 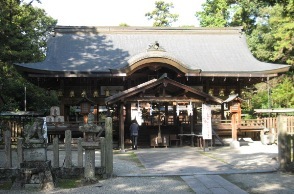 The information on this web page comes from signs and the web site of Ōyamato Shrine.